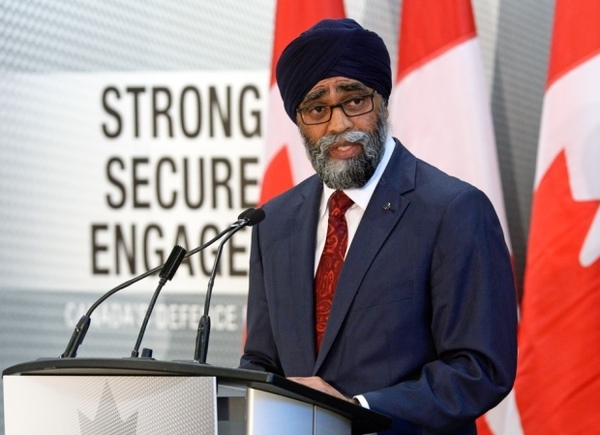 Freeland's speech, taken with defence minister Harjit Sajjan's policy speech on Thursday, are, on balance, an interesting and commendable strategic effort by the government. The strongest part of the foreign minister's speech was the foretaste she gave of the defence minister's comments that followed, when she said that "Canadian diplomacy and development sometimes require the backing of hard power." While occasional lip service was paid to these purposeful views by the Stephen Harper and Jean Chrétien governments, this is the first plausible utterance of such words by an authorized spokesperson since the piping days of Brian Mulroney. If he had been listened to, our Arctic approaches would be protected by our own nuclear submarines, and not just by the U.S. Navy assisted by our native people in kayaks. The foreign minister made the customary and obligatory references to international organizations and peacekeeping, but regrettably, gave no hint of proposing the radical reforms several of those organizations desperately require and that Canada is uniquely qualified to advocate. Peacekeeping must cease to be the renting out of UN-sponsored forces, for which the main powers, especially the U.S., have been paying hard currency, and where many of the contributing countries (though certainly never Canada), supplement their incomes by renting their peacekeepers out to the local factions to exacerbate the war they are supposed to be damping down. Instead of campaigning for the favour of the corrupt national hypocrisies that in practice control the dispositions of the General Assembly, we should be asking that countries that do not approach the human rights standards of the Universal Declaration on Human Rights, partially composed by Canadian John Humphry (whom Freeland graciously mentioned) should be reduced to non-voting observer status until they pull up their socks. By that method the human rights and arms control apparatus of the UN would pass out of the hands of the totalitarian and despotic states that largely control them now. The foreign minister also gave the traditional endorsement of NATO and NORAD, but especially as her colleague the defence minister announced the next day a very substantial increase in defence spending over the next decade, she could have proposed the expansion of NATO to all passably democratic countries in the world who wish to subscribe to and support a defensive alliance, protecting existing borders. (There would be the usual complications about the frontiers of Israel.) NATO was for the containment of the Soviet Union; it has a wider mission now. These organizations, and the IMF and others, have been deformed by the passage of years and the seizure of unearned influence by irresponsible and often anti-Western countries. The government is returning to the post-St. Laurent Liberal, and occasional Conservative, policy of professing admiration and friendship for the United States and implying disapproval of the current administration in Washington. This was what John Diefenbaker did with John F. Kennedy, Lester Pearson with Lyndon Johnson, Pierre Trudeau with Richard Nixon and Ronald Reagan, and both Chrétien and Harper with George W. Bush and finally with Barack Obama. It is essentially a slightly shabby game of pandering to moderate anti-Americanism while fending off a charge of anti-Americanism by praising Norman Rockwell's America while disparaging Donald Trump's America (as if it were unAmerican). There is also the reflexive over-emphasis on climate change. It was introduced at the start of the speech as the "greatest ... shared human imperative." This is not only dubious, as we have no idea what the full extent, cause or likely consequences of climate change are. It also incites grim fears that the baleful legacy of the renewable energy-driven McGuinty-Wynne negative economic miracle in Ontario may have been carried to Ottawa. Ironically, the chief antidote to such an unhappy turn of events will be the economic growth likely to be generated by the Trump administration, which will wash into Canada. That administration has no such isolationist and protectionist leanings as Freeland imputed to it, only a desire not to carry an unjustly excessive share of the West's defence burden or to promote free trade by allowing other countries to export unemployment to the United States. These are unexceptionable goals, though this president could certainly impart them in a more emollient tenor and vocabulary. As Freeland and the prime minister whom she serves must know, the longest step they could take in assuring smooth relations with Washington is precisely the measure announced the next day by Sajjan, of increasing Canadian defence spending by 70 per cent in the next decade. It is also, as I have written here until I was almost blue in the face, the best form of public-sector economic stimulus and the only way to achieve any political influence for Canada. Climate change really has nothing to do with foreign policy, as each country at Paris just said what their countrymen would approve, from nothing in China and many other countries, to confirmation of what has already been effortlessly achieved in environmentally simple places like Denmark. Apart from the compulsive references to that chimera, the most unsatisfactory element of the Freeland speech was the even more worm-eaten chestnut that Canada is a "middle power," echoing what John Diefenbaker enunciated to the United Nations in 1960. It was so then but is not today. Of the 198 countries in the world (counting Taiwan, the Vatican, and Palestine), Canada is for its GDP, resources, talent of work force, stability of institutions and quality of life, and by any other measurement except population and military capability, one of the 10 or 12 most important in the world. Canadians don't generally realize that or think like that, but we must grow into the place we have earned and if the foreign minister won't tell them that, who will? The answer, in effect, is the defence minister, who promised to increase the forces, regular and reserves, by 5,000; warplanes from fewer than 60 "aging" CF-18's to 88 first-line aircraft, and seaworthy ocean-going warships to 15. This will enable us to be taken seriously in the Western Alliance for the first time since Mulroney's era (and much of that was due to Brian Mulroney's high personal standing with Ronald Reagan and George H.W. Bush). The increase in outlays over 10 years from $18.9 billion to $32.7 billion should bring us almost online with our NATO promises. Sajjan also announced some fine initiatives to make the armed forces a more attractive career, including better health care and veterans' benefits, and partial elimination of income tax for anyone deployed to active foreign theatres. It was a first-class defence paper, uttered with apparent conviction. Unfortunately, the minister's aspersions of the previous government in this area were entirely justified, though he could have included the Chrétien government as well. The government shouldn't flirt with Trump-bashing; a little courtesy would gain a lot of mileage in key policy areas. Obama's tasteless address in Montreal (for $500,000) last week, while Hillary Clinton was explaining that her electoral defeat was due to the stupidity of her fellow Americans and the incompetence of everyone except herself, should cause a few Canadians to come out from under the propaganda carpet-bombing of the U.S. national media and their Canadian parrots and realize that better days are ahead. Trump is not, as Freeland said, about to "shrug off the burden of world leadership." He is going to kick the free riders who just want a free U.S. military guaranty off the bus, and define the U.S. national interest mid-way between George W. Bush's trigger-happy interventionism and Obama's outright abdication. The Canadian government had a much better week than its American or British analogues.